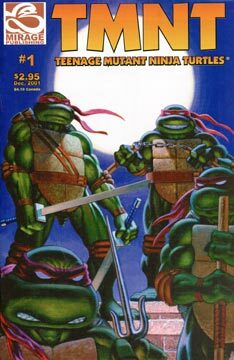 Strange happenings on the moon shift to the alleys of NYC where we find the TMNT, a bit older and hopefully wiser, experiencing a severe deja vu as they battle a gang of thugs calling themselves the Madhattan Maulitia. Due to the gang’s use of firearms and rooftop snowmobiles (?! ), our heroes decide that a retreat home is in order. Leo and Raph head off together as Donatello appropriates one of the snowmobiles. Michelangelo, a bit behind the others, is struck by a bus as he tries to flag down Don, and is quickly found by a strangely costumed dude. As he’s headed for the Turtles’ secret abode, Don loses control of the snowmobile and crashes through a wall of the sewer, where he discovers an abandoned armored car. Elsewhere, Casey and April, who are now married, prepare to visit the doctor to check on April’s intended pregnancy. Shadow, a teenager herself these days, is training with Master Splinter at the farm house in Northampton, Massachusetts – and she’s feeling ill at ease.